Brain injuries are some of the most difficult to diagnose after an accident. The injuries are often life altering, if not deadly. Many victims may never return to their previous quality of life. Traumatic brain injuries (TBI) are typically acute injuries that occur as the result of an impact-related accident. If you or someone you know suffered a brain injury as a result of the conduct of another, consult an attorney as soon as possible. Facing increasing medical expenses, lost wages, and other accident consequences can make the recovery process more difficult. Filing a civil lawsuit gives you the opportunity to obtain financial compensation from the party responsible for an accidental injury or death. Attorney Dennis W. Potts understands how devastating these injuries can be, and he has the experience you need to secure damages and start to rebuild your life. Almost any accident, from motor vehicle to sports-related, can yield a brain injury. Unlike other accident injuries, though, a brain injury can affect every aspect of a person’s life. It can change your personality, leave a certain part of your body paralyzed, cause chronic tingling or pain, and disrupt daily life. Every individual heals differently from brain injuries. Two people exhibiting similar damage may experience different symptoms as well as short-term and long-term consequences. 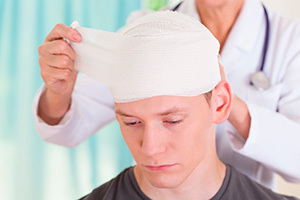 A person suffering from a brain injury may not even realize he or she is injured. In some cases, it may be some time before anyone realizes there is an injury at all. Even a minor brain injury can lead to long-term effects, so it is vital to seek legal counsel as soon as you have a TBI diagnosis. If these symptoms follow an accident or head injury, they may require medical attention. Contact medical services immediately if you notice severe signs such as repeated vomiting, slurred speech, a severe headache that will not go away, convulsions, or unconsciousness (someone cannot be woken up). At the Law Office of Dennis W. Potts in Honolulu, Hawai’i, each case begins with a free initial consultation. During that conversation, Attorney Potts will review the details of your case and help you determine the best course of action. Brain injury cases require thorough investigations that require medical reports, accident evidence, and witness testimony, if available. Every brain injury case is different. While he cannot erase an injury, he will do everything he can to make the future better. The office is known for creating strong cases against the people responsible for accidents. Whether an individual, product manufacturer, or other company caused the accident, Attorney Dennis W. Potts can help you secure the compensation you need to move forward. In addition to securing compensation to cover medical expenses and lost wages, damages may cover the cost of rehabilitation and loss of quality of life. In some cases, you may even be able to secure punitive damages that include a financial sum above and beyond other damages as a means of punishing the defendant for his or her gross negligence. Attorney Dennis W. Potts works on all cases on a no recovery, no fee basis. This means if he is not able to recover money for you, you will not have to pay a dime. Even minor brain injuries can have lasting consequences, so begin by contacting the skilled attorney, Dennis W. Potts, at (808) 537-4575 for more information.